Australians have many legal soccer betting sites available to them in 2019, with all of the major corporate bookmakers boasting extensive betting on both domestic and international football. The no.1 soccer comp in Australia is the A-League but in terms of betting there is great interest in the English Premier League, the J-League and various other European football leagues. This guide to the best soccer betting sites in 2019 will guide you through everything you need to know to successfully plunder an online bookmaker, including major soccer bet types, the most popular comps to bet on and the top football betting sites in Australia. As the world’s most popular sport, football offers an almost unlimited variety of betting options. A single top-flight match can come with hundreds of markets attached, covering everything from standard head-to-head bets to the most obscure of exotics. The popular bet types below offer but a glimpse of the choices available to punters at leading Australian football bookies. Here is what a standard win-draw-win market looks like at popular Australian bookmaker Sportsbet. Match bets, or win markets, are the simplest form of football wagering. The standard win-draw-win option needs little explanation: you can bet that either Team A will win, or Team B will win, or the match will end in a draw. Other markets, however, offer some sort of insurance should your result not salute, although at lesser odds than win-draw-win bets. Draw no bet – Pick either Team A or Team B to win. If the match ends in a draw, ‘no bet’ is declared and your stake is returned. Double chance – Bet on two possible outcomes at once. The choices are: Team A to win or draw; Team B to win or draw; and Team A or Team B to win. Bookies run a host of betting options for both the first half and the second half, the most common of which is a double bet on both the half-time result and the full-time result. This is a nine-way market that offers excellent value for unusual results. Much like a handicap in golf, this kind of line bet levels out the odds between an in-form side and an underdog. Each team is assigned a goal handicap against the scratch result – negative for the favourite, positive for the underdog. Unlike Asian handicap lines, which are two-way markets with no option to bet on a tie, standard Australian handicaps also allow punters to back a nett draw. For example, let’s say we are betting on the Merseyside derby. If Liverpool are handicapped at -1.0, they must win by more than one goal to beat the line; if Everton are at +1.0, they need to lose by less than one goal (i.e draw or win); and for the handicap to tie, Liverpool have to win by exactly one goal. Another popular soccer handicap is the over/under goal line, in which you wager that the total number of goals scored in the match will be either over or under the bookie’s line. If the line is set at +/-2.5 goals, for instance, the under bet wins with two goals or fewer and the over bet wins with three goals or more. Soccer wagering is full of high-risk, high-reward markets, and perhaps none more so than the correct score option. Starting odds for this type of bet rarely go lower than $6, so punters who have a good eye for recent form, team news and head-to-head stats can find stacks of value by tipping both the winner and the exact scoreline. – Both teams to score? For grandeur, prestige and global appeal, only the Summer Olympics can compare to the FIFA World Cup. Although the tournament finals are held once every four years, futures markets and qualifying rounds offer huge punting opportunities no matter how far away the real deal is – in this case, Russia 2018. There are also plenty of continental championships and world club tournaments, including men’s, women’s and youth events, to keep punters busy between World Cup finals. 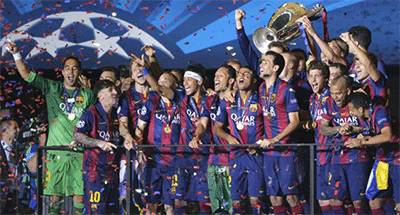 Barcelona is pictured celebrating its 2015 Champions League victory. Domestic leagues and cup competitions make up an overwhelming majority of the world’s football action. The United Kingdom alone boasts more than 20 senior league divisions, from the world-famous English Premier League to the semi-pro Conference comps – all of which can be found at Australia’s top soccer betting sites. There are also a number of inter-league tourneys featuring the top clubs from various nations, including the UEFA Champions League – the most coveted club trophy in football and, according to many, second only to the FIFA World Cup for international prestige. Harry Kewell, pictured playing for Liverpool, is arguably the most successful Australian to have played in the A-League. The injury-plagued star Socceroo played his first game in the A-League at the end of his career, in a largely unsuccessful stint with Melbourne Victory and Heart. BettingSite.com.au aims to become a prominent source of information for those who like to bet on football and want to learn more about soccer betting sites in Australia. We are building our base of articles for football fans and often cover the most relevant tournaments featuring our beloved Socceroos. So be sure to bookmark this page and check back for updates. The top six is starting to take shape as we look at the best multi picks for week nine of the A-League. Perth Glory are still undefeated as we look at the best bets for this week's A-League action.